What a fantastic job this author does with this app! Michael Collier is a geologist as well as a photographer and this man knows how to make it fun and enticing. His love for Geology beams from him as does his desire to share this information. The images in this educational app are breath taking! The narration is a voice that conveys calmly what the images pronounce vividly! Collier introduces the steps that build and mold the mountains. Topics included are: tectonics, volcanoes, glaciers,faults, and erosion. After that we fly with him over American Mountains. The list includes The Appalachians, The Pacific Coast ranges, The Rockies, The Tetons, and the Alaskan ranges. Don’t forget to pinch and zoom on the diagrams! Reviewing this app, I felt the appreciation and awe of living in the same place as these monumental teachers! The Amazing Power of Water! I’ve also attached two photos. They were taken when we went to Michael’s home in Flagstaff to begin work on the app. 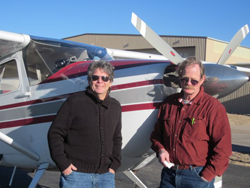 We spent a few days flying in his single engine Cessna getting to see Michael’s spectacular view of the world. The gent on your left is me, Stuart Waldman. Michael Collier is on the right. 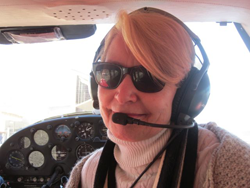 My wife and partner, Elizabeth Mann is wearing the aviator headphones. 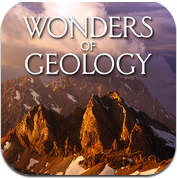 What was the initial inspiration for Wonders of Geology? We had published Michael Collier’s book, Over the Mountains. In the book Michael, a geologist as well as a writer, photographer and pilot used his aerial images to explain the geological process that created mountains When the iPad came out, we jumped at the chance to beyond the book we the addition of sound, animation, pinch and zoom, moving graphics, easy navigation, and the iPad’s brilliant screen and thousand of pixels. That it’s not just a pretty face. It’s all too easy to rely all the bells and whistles of the iPad and forget about what your app is about. We used the bells and whistles tools to transmit scientific knowledge in a new, exciting and effective manner. My fascination with geology springs from a lifelong love of landscape. Pretty scenery is always appealing, but real magic happens when a deeper understanding of the earth allows mountains and rivers and canyons to spring off the page and blossom into three dimensions in your mind. I’ve been photographing and publishing about earth history for forty years. Now with the iPad I’m finally able to fully share delightful ideas and amazing processes. 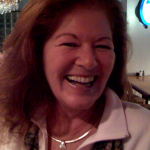 Narration gives voice to enthusiasm. All of a sudden animations carry viewers up through geologic time.